A favorite chocolatier of mine has finally made it to Paris, Henri Le Roux – although he’s best known for his C.B.S. 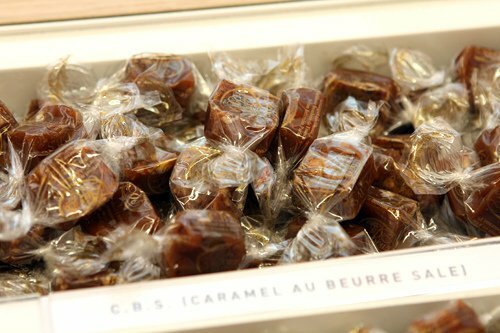 caramels, which are made in Brittany, a region known for its copious use of salted butter. 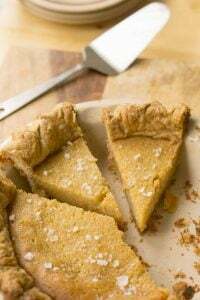 Whenever I’ve traveled to that part of France, I’m always delighted at their lack of restraint, and they use salty butter in everything from buckwheat galettes, to melting into large pots of salted butter caramel sauce, which they have no problem dousing on everything. I visited the original shop in Quiberon, location at the end of a long peninsula, which was worth the drive to the end, where land met the Atlantic. And where I met Chef Le Roux a few years ago and spent the better part of the morning with him while he took me around the shop, showing me how his world-famous caramels were made and individually wrapped. 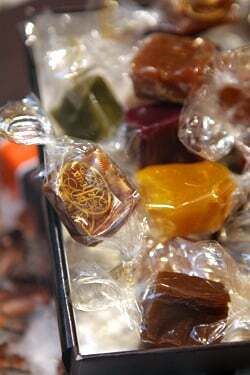 Although nowadays salted butter caramels are fairly common, he really put the butter/salt/caramel combination on the map and people traveled from all over to get his caramels and other confections. 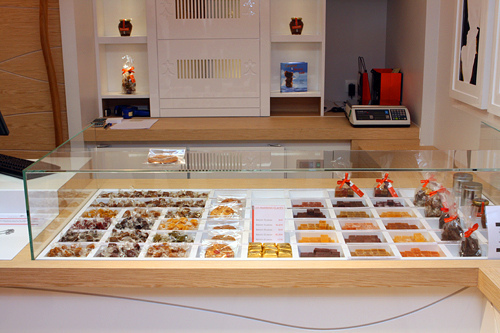 Now his shop has landed in Paris, and he’s partnered with a Japanese company as well, and together they’ve expended their range of flavors so you’ll not only find traditional caramels, such as his famous C.B.S. (caramel-beurre-salé), tarte Tatin (caramel-apple), and citron vert (lime), but also tender little squares melded with black tea and yuzu-matcha, a combination that’s become quite popular in Paris – all tightly wrapped up and ready to go home with you, or me. People have been known to swoon conspicuously over Le Caramelier, a salted butter caramel pâte à tartiner riddled with crunchy nuts. During my time in France, I’ve kept more than a few jars of that stashed away in my refrigerator for emergency afternoon spreading sessions. I’m pretty wild for his Florentines au blé noir, hand-sized circles of chocolate and caramelized almonds with buckwheat and roasted cocoa nibs melded together. And if that’s not good enough, one side is completely slathered in dark bittersweet chocolate. 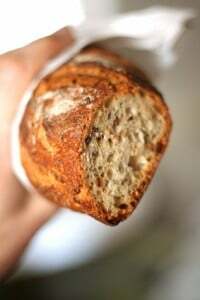 I have a thing for buckwheat, and I try to sneak some into a lot of my cooking, even my baking, because I find its earthy flavor is a spot-on companion to chocolate and caramel. When I visited last week, I was happy to see they’re still making Embruns, a chocolate bar with éclats (fragments) of fleur de sel, a combination I find irresistible, as well as tablets embedded with almonds pralines, pistachios, and candied orange peel. When we’d gone to the original shop in Quiberon, Romain had a tablet of chocolate that he said was the best chocolate bar he’s ever had in his life. “It’s engraved in my memory” he told me. Yet he couldn’t remember which one it was (even though I shook him pretty hard, to jar it loose from his memory), so I guess I’ll just have to start working my way through all his chocolate bars, until I land on it. It’s a little dangerous knowing that Chef Le Roux’s chocolates and caramels are so close to me now – and they’re also available at A l’Etoile d’Or, another must-stop in Paris. But I’m rationalizing that since I have to cross the river to get there from where I live, I’ll be able to control myself. I just can’t say for how long. Heading up North in January (I’m studying in Aix, but from San Francisco.) Here is yet another shop I’m going to have to visit! In fact, I think most stops are coming from the blog! Thanks for another great recommendation! 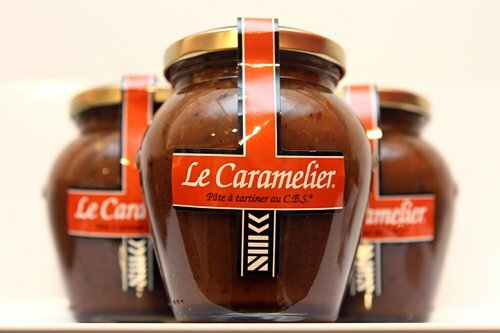 Oh I’ve got the jar of Le Caramelier. Can’t wait to come back to Paris and visit his shop. I’m feeling some serious envy towards you right now, but guess I should be glad to be so far away from such a dangerous place. The jar of salted butter caramel is calling to me. I’ve been twice since they opened. Hehe! My second favorite caramel is ble noir (first being C.B.S., of course). Their matcha-yuzu is also delicious. I have just stuck to their caramels so far but Romain’s praise of best chocolate bar makes me think I need to get some tablettes too! I’m so glad they’ve opened in Paris! 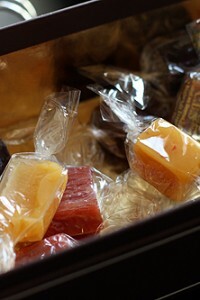 Those are so beautiful and elegant…I could definitely go for some of the salted butter caramels right now! Uh-oh, NOW I’m in trouble….between Le Roux and Genin, my bank account and diet are toast! 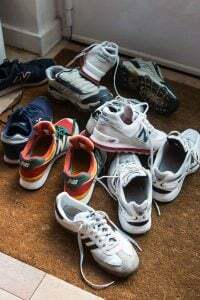 Too bad you didn’t write this a couple of days ago, we just got back from a Saint Nicholas weekend at a gite near Auray, about 45 minutes from Quiberon. Copious amounts of salted butter were consumed (almost a kilo for six over the weekend) as well as your cheesecake brownies. Excellent, makes me want to taste these caramels with salt and butter! Thanks for this piece. What an incredible shop. Their chocolates look so exquisite (and mouth watering!). I love that beautiful dimpled pattern on those chocolates… I’d be curious as to what type of device would do that… Also, I would not be able to keep that jar of Le Caramelier in my house, it would be gone in a few days. and so glad to hear that he uses salted butter–a lot. thank goodness! 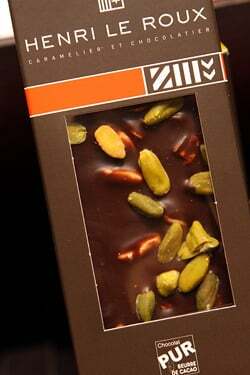 that pistachio chocolate looks amazing. bookmarking for my next trip to paris. Engraved on his memory — and he can’t remember? Yeah, he does need a shaking. Perhaps administered after you sample your way through all chocolate bars. Oh my!! Le Caramelier sounds like just what I like to have at breakfast … much to the disagreement of my dentist! Good thing I will be in Paris and Brittany over Christmas – I hope to come home with a jar or two, plus maybe a box or three of CBS :-) Thanks for sharing this information! Why did David cross the river? For the chocolate, of course! And if you cross the river on foot, you’ll walk off the calories, right? David, I love your writing and read every post…but today you had me at the first 4 photos…”acqua in bocca” just looking at these gorgeous chocolates…you have the best job in the world…thanks for sharing with the rest of us! 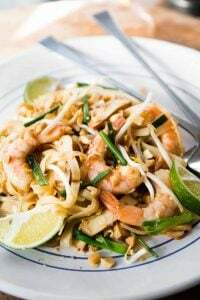 oh, this looks divine. lucky you! Salted sweets are really the thing these days. I just purchased a bar of Lindt chocolate with a touch of sea salt. Amazing combination! 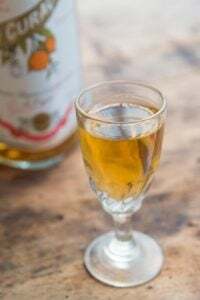 Thanks for the tip on Henri le Roux. You’re driving me around the bend with this one and I’m not even a caramel lover. I might have to go get some of that caramel/salt/nut spread. You really test my delayed gratification skills (mostly nonexistant)david. The caramels sound dangerous and irresistable. Ok ..I just ordered 500g of C B S ..shipping as much as caramels..Merry Christmas to me! When my brother was traveling abroad, he brought me back some of Henri Le Roux’s chocolate. It is definitely worth a trip overseas just for that. WOW! I can imagine how good that smells just by looking at it! I can’t wait to try it! 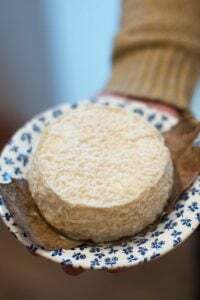 I know this has nothing to do with your current post, but both my sister in NC and I, in London, have just made Flo Braker’s pain d’amande recipe, where you are referenced. They were transcontinental disaster. Any suggestions? Do you have a recipe? 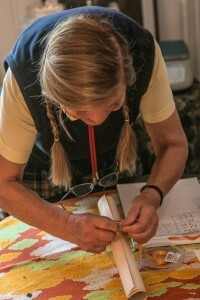 I made them countless times and I posted the Pain d’amande recipe with some pictures on the site, showing the end result. This is just mean. I’m stuck at my desk with chocolate cravings now. Argghhh! 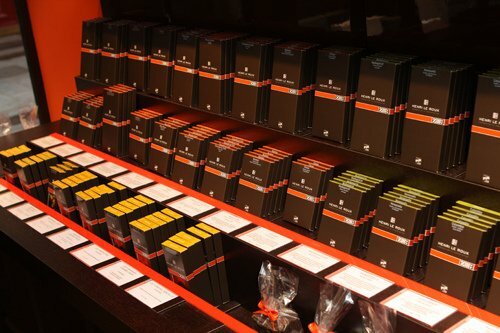 Just returned from Paris…if I only knew about that Le Caramelier and Henri Le Roux chocolate before I left. Guess a visit for good chocolate is a good excuse for another trip. Maybe next year. 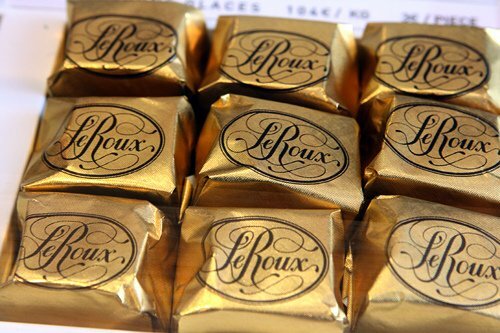 funny how excited i was when i first heard le roux would be opening in paris, seeing i live in zürich (and actually can find his cbs & caramelier here – only, no chocolate). 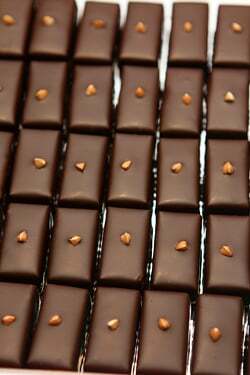 but now it’s not just at the salon du chocolat or at denise’s shop where i can get my fill of those buckwheat caramels and his bars that i just love, like the embruns you mentioned above. and oooh, the goviro. 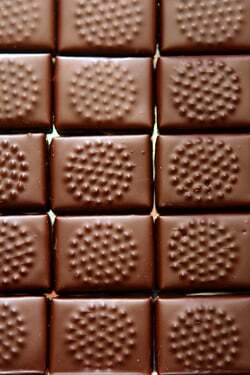 have you tasted this bar ? i have a hard time not devouring it in one sitting – dark chocolate with fleur de sel, crêpes dentelle & caramelized almonds. miam ! 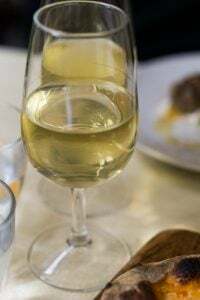 had a very disappointing dinner at verjus last week. came with such high hopes..certainly way to little for the money. the chef is good but not good enough to charge so much for so little. very nice people, very nice setting…should have more small plates per menu or larger portion for the main or?? . good idea REALLY needs reworking. As my partner is a chocoholic I am sure she would love to have a visit to the shop in Quiberon, as we a re based in Brittany. Or even better a romantic weekend in Paris to visit the new outlet. Thanks for the post, great pictures. Thanks for the recipe for pain d’amande. Yours is quite different from the one we used which we got from the Food 52 site.I will be making them later. When are they going to get the technology to transmit taste by computer – have tongue will lick! Wouldn’t that be wonderful? Salivating at my desk! Nothing better than salt to bring caramel to life. I love reading your blog so much because it always makes me deliciously nostalgic for Paris! Thank you. Have you heard of the chocolate Pyreneen by Lindt, but was first made by a French man named, Rozan de Mazilly, which only comes out in winter or the holidays. Would love to hear what you know and think about it. hi, great post! I love reading your posts because there all so different and interesting. One day, are you going to start your own chocolate or chocolate pastry store? Just finished a jar of dulce de leche. With my fingers. So the caramel is probably a bad idea. Any chance that we will be seeing any buckwheat recipes here soon? I would love to try making something other than pancakes with it. 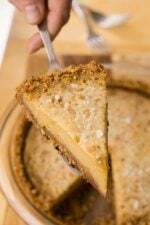 There are several buckwheat recipes on the site – Buckwheat galettes (crêpes), Chocolate-Persimmon Muffins, and Kig ha farz..give ’em a try! Wow I think I just had a chocolate overload just looking at these pictures. This looks amazing. I’ve never heard of Henri Le Roux. I don’t believe his brand is in the states but it sounds delicious! I will for sure have to look out for these amazing looking candies in my future travels! The salted butter caramel sounds amazing! Are there shipping options?! Henri le Roux, Henri Le Roux … everywhere these days, blogs, newspapers…very talented in marketing his new Paris shop. As for the products,., Le Caramelier and the yuzy/macha thing are amazing. No doubt. I was very, very disappointed by…his caramels! There are many ones in Paris that are much, much better (Pierre Hermé to name one in the list). Enroute to SoV (South of Valencia, Spain) for Christmas and New Year, we stopped to load up on wine and food in Carcassonne and lo and behold I found Le Caramelier. I thought American Peanut Butter or a tiny bit of extra salt on my buttered toast in the morning was heaven, but Mon Dieu! After reading all the applause (on this site and elsewhere) about Henri Leroux,I placed an order with different items. Well, the caramels, traditionals or new style…not impressive. The yuzu/macha chocolate was too sweet and too vaniliated to my taste. Funny, but the best were probably the chocolates! 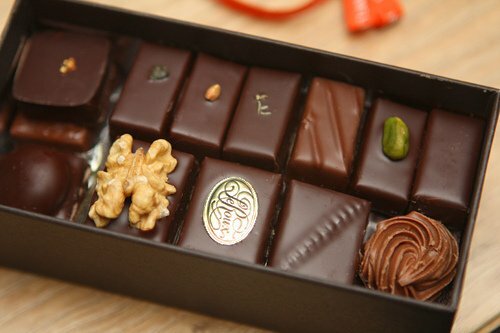 Le Roux…one of the many many good chocolatiers and caramel makers we have here in France. Apparently his strong point is on buzz and marketing! Maybe I am too spoiled to be impressed?